Above Middle: At Papados kafeneio, Rebeta, with friends. From left, we are: myself; Eustratios Afaloniatis, Stavros Afaloniatis and Mihalis Voulgellis. Above: Easter, 1963. Our infantry unit was at Argos Oristiko, Kastorias, at the time. Above: With my wife, Alexandra and our three children, Giorgos, Savvas and Petros. 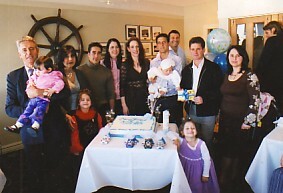 Above Right: With my wife, Alexandra, and our children and grandchildren. From left, we are: myself, holding my grandaughter, Georgina; my wife, Alexandra with our grandaughter, Alexandra; Petros and his wife, Tracey; Savvas and his wife, Yvonne, with their son, Nikola; Giorgos and his wife, Effie. In the foreground is Savvas' daughter, Kristen. Since this photograph, Peter and Tracey have had a son, Christian, and Giorgos and Effie have had a son, Andreas.